We offer free shipping on all orders over $70 in value. 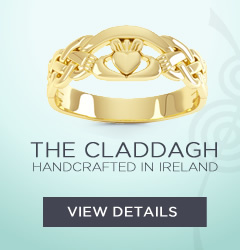 We want you to be totally confident in the knowledge that we have taken the greatest care possible in getting your piece of Irish designer jewelry to you. Each piece is carefully packaged and delivered by our Jewelery designers from our home in the North West of Ireland. All orders placed by Ardri Jewellery are fully insured by us. In the unlikely event that the item arrives damaged, we will replace or repair it at no extra charge. Please contact us if there is any problems with your order. For high value orders, you may receive an invoice to pay the shipping carrier for import taxes incurred by your respective country. Ardri Jewellery does not pay any import taxes for any items. You can get an estimate of what your import taxes may be from Dutycalculator.com, but this is a third party website, and only an estimate. If your wish to return or exchange an item please e-mail info@ardrijewellery.com quoting your order number and giving the reason for your return. We will give you all the details you need to send the item back to us. Shipping costs will be deducted from all refunds except where the piece is being returned due to a manufacturing fault in which case Ardri Jewellery will cover this cost. Returns and exchanges can be made on full or partial purchases. If for any reason you are not happy with your purchase, you may return it to us, unworn and in its original packaging for a full refund or exchange. Our returns policy does not apply to handmade earrings (for hygiene reasons) or engraved items.